Does anyone recognise this orchid? 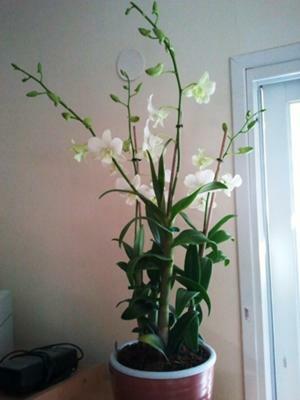 I havent seen any pictures of it on google/yahoo searches or on any other orchid sites/stores. I bought it in Haifa at the 2012 Flower show. I tried to upload 4 pictures but it it didn't seem to work. (admin edit: fixed!) 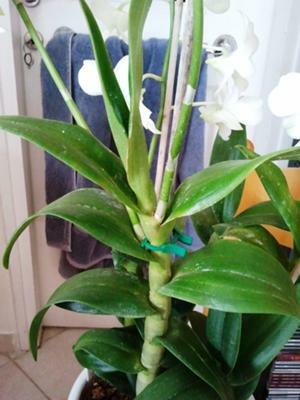 the plant grows out up like bamboo with leafs growing upword half un inch wide and about 3 inches long growing upward with a pointy end. the flowers come out from the center of the bamboo like cane and from below the lower leaf from the top. 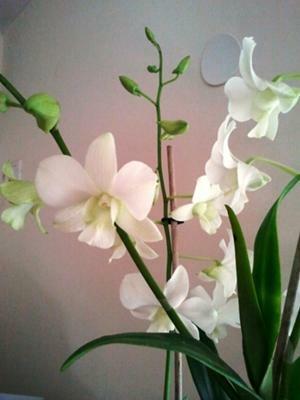 the flowers are white and as they mature they flip and open and are white. in my pot there are 4 of these bamboo like orchids growing closely together and are a bit less than a meter high. Comments for Does anyone recognise this orchid? This orchid is a Dendrobium hybrid, very likely with the species Dendrobium phalaenopsis in its parentage. This will be one of the warmer-growing Dendrobiums, and evergreen. It likes a bit less water during the flowering season than during the growing season, but not a full dry rest; just let the potting mix get pretty dry, then water again. Light should be bright, but direct sunlight is too much. It's a very nice looking plant, and it looks healthy too! Thanks alot, this realy helps me. It is very healty now because i bought it about 4 days ago and so far it has been doing great. The real test is to see if i can keep it healthy over the long term and I still havent goten it to my room where i want it. My other orchid a Phalaneopsis isent doing to well. I have desided to try and polinate it and try to get seeds and i've allready read up on that and it seems chalaging but the flowers now seem to be closing. I've searched the web and it seems to be just in shok due to the change in the invironment it was in. What do you think? 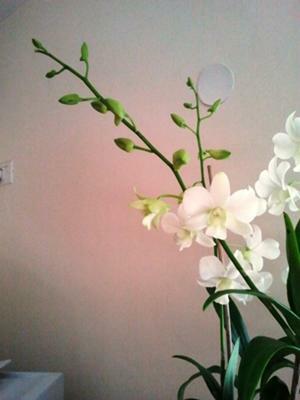 How can you tell which family the orchid comes from or its parantege? there are just so many? I was very suprized and dilighted but more suprized that that everyday liquid added to cakes and cookies and creams is actualy from an orchid. Turns out its name is Vanilla!! !